There are many topics in Iran which journalists, activists, and artists can not touch on. Amongst these, the devastating quality of life of the of Baha'i religious minority is likely the most challenging and invisible; a dark stain on Iranian society, with the torment of thousands of people concealed just beneath the surface of public discourse. 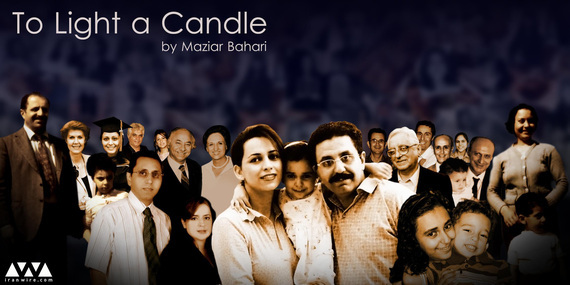 A revealing new documentary, "To Light a Candle", made by Iran's award winning filmmaker and journalist Maziar Bahari is a turning point in addressing the circumstance of Baha'is in Iran. It unveils decades of repression, persecution and intimidation against a peaceful community of Iranians whose lives have been dramatically undermined by religious intolerance by the Iranian ruling class. Bahari is a former Newsweek correspondent in Tehran, and the author of the memoir "And Then They Came After Me," which is adapted for the screen by Jon Stewart. Following Iran's 2009 presidential election, he was arrested and detained for more than four months in Iran's most notorious prison. Right after his release, Bahari left Tehran to join his wife and newborn daughter in London. In a family memoir "Then They Came After Me," he explains the mindset of his interrogators and the unbearable level of inhumanity deployed in targeting those who bring to the fore topics the government does not want addressed. When he moved to London, Bahari was no longer restricted by the barriers of censorship and fear within Iran--- he was suddenly able to write the poignant stories that no one dared to talk about. He continued his career by making a new documentary, "Forced Confessions", limning the oppressive practice of drawing out forced confessions from the accused in Iran. In this chilling documentary Bahari features five former Iranian prisoners who were hunted by intelligence forces and forced to confess against their uncommitted crimes before national TV. As newspapers and activists cannot speak publicly of the use of "forced confessions" against prisoners, judiciary and intelligence agencies have continued to employ this method--intimidating the public and justifying the arrests of political and cultural figures, notably Iran's Supreme Leader Ayatollah Ali Khamenei. The movie aired on BBC Persian, which enjoys a wide following within Iran as well as throughout the diaspora. As forced confessions are still utilized by the Iranian Bahari's movie has played a significant role in challenging public discourse, shedding light on the inhumane treatment of religious and political prisoners. "To light a Candle," another eye-opening film from Bahari utilizes dozens of heartbreaking interviews to tell the story of those Baha'is who have lost family members over the past three decades due to ongoing religious persecution. It gives a vivid picture of a community that has been silenced and oppressed for their religious beliefs. The movie provides extensive background and context in which the situation of Baha'is both before and after the 1979 revolution is portrayed. In the first five years following the revolution, an estimated 200 Baha'is were executed in Iran. According to the Bahai International Community, a human rights organization that has been advocating for the rights of the Baha'i community since 2005, more than 710 Baha'is have been arrested, and the number of Baha'is in prison has risen exponentially from fewer than five to a current figure of 136. The list of prisoners includes all seven members of a former leadership group within the Baha'i community of Iran. In 2010, the seven were wrongly sentenced to 20 years in prison, the longest term currently faced by prisoners of conscience in Iran. In contemporary Iranian society, the Baha'i community is under constant threat of property raids, arrests, and detention or imprisonment. As Baha'is are banned from the university system it is inspiring to hear the stories of the courageous individuals who succeeded in creating an underground university to ensure their children would have access to higher education. The result is an informal university infrastructure that has been targeted and repeatedly dismantled by Iranian authorities, but continues to be rebuilt by those Baha'is who still live in Iran. "To Light a Candle" also speaks of a paradigm shift in Iranian society where influential political and cultural figures are beginning to speak out about the situation of Baha'is in Iran. This new trend has been a powerful tool in enlightening millions of people on an issue that has long been manipulated by the state's propaganda machinery which has succeeded in creating a misleading narrative on Baha'is founded upon false myths and distorted reality. The film is the product of extensive research on the historical background of the community and is a display of Bahari's skill as a filmmaker and masterful storyteller. "To Light a Candle," is a 53 minute long Persian film. A version of the film with English subtitles is soon to be released.